The bus transfer was convenient and departed on time. Well organized. The shuttle to the Blue Lagoon was quick and on time getting to the Blue Lagoon. Our return trip back from the Blue Lagoon was a little rough. The driver didn't give me the correct stop number to get off the bus. I think that was due to he didn't understand the name of my hotel. Then when we tried to get him to just stop and let us off, he was either not hearing us or ignoring us. When he finally stopped, he told us where we had to go to our hotel and it was in the opposite direction that our hotel was located. Luckily we knew the right direction to go. So that is why I think he didn't understand the name of our hotel. Other than that the shuttle bus was great. Blue lagoon was an incredible experience despite the weather! With a mix of snow, hail, and sunshine, it was a surreal way to see the variants of Iceland in the most relaxing way possible! The shuttle bus service was really good and the staff were very helpful. Amazing! Don't miss this experience! It was cold and rainy and we still had a great time. The transfer could have been better, but we got there fine, which is the most important thing. The bus arrived on time and took us to the main bus station where we transferred onto a large coach and this departed on time. Highly recommended this tour company. Our trip to the blue lagoon was wonderful. We're picked up on time as scheduled from the hotel to the lagoon but the bus going back was a bit late. However, both the drivers where really nice and accomodating. Travel was smooth as well and comfortable. The Blue Lagoon Shuttle/Bus Transfer was exactly as advertised. Pick-up was on time and the transfer to the bus station and then the Blue Lagoon was without incident, as was the return trip. I would recommend this service to a friend without hesitation. The trip was great. They were prompt however the bus from the hotel to the bus terminal did not help AT ALL with the luggage (he just stayed in his seat). Once we changed buses to head to the blue lagoon, that driver was great and helped all of us with our luggage. Overall a positive experience. The transfer was great and cheaper than the Blue Lagoon bus provider Destination Blue Lagoon. In terms of expectation, I would flag that you are picked up by a smaller bus and taken to the bus terminal. You then have to get a pass in the office before getting on the larger coach to get to the Lagoon. The staff are all friendly and informative in making this happen - you’re unlikely to miss your bus. On the return you don’t go from the coach to smaller buses and transferred back, the coach stops at the numbered bus stops in town. Be aware of this and check your booking t&cs so you don’t get an unpleasant surprise. Smooth and easy booking process, bus was on time. Only thing I will say is that the onward journey to the airport had quite limited times. We got the 2pm one as the other one after that would have been cutting it fine for getting to the airport but instead we was 4 hours early. Needed a 3pm bus time slot. Smooth and easy booking process, bus was on time. Only thing I will say is that the onward journey to the airport didn’t had quite limited times. We got the 2pm one as the one after that would have been cutting it fine for getting to the airport but instead we was 4 hours early. Needed a 3pm bus time slot. very prompt service, picked up at the specified time, and picked up from the blue lagoon at the times it said it would. cheper than a package and just the exact same service. couldnt ask for more. The transfer was great - hassle-free! The bus was timely & we had no trouble at all. The bus transfer was nice, easy, and on-time! I didn't receive my voucher for the Blue Lagoon and transfer originally, but the Guide to Iceland staff was on top of it and got me there seamlessly! Wonderful customer service! The transfer is a good experience. accurate description. thank you. Excellent service, with very friendly and helpful staff. Prompt pick up from our hotel. Leaving was very easy too, the bus leaves and drops you back at your location every 1 hr. It is good. Accurate pick up time. It said the pick up time was 10:30 for our transportation, however they only picked us up at around 11:15 because we were on the high way. It would have been appreciated if they mentioned to us our exact pick up time according to our location so we could have used our time wisely!!! Overall positive experience. The buses arrived at approx the times indicated. Blue lagoon is a great experience even if a bit touristy. Bus transfer from hotel and from the main departure point was on time. Contact with the company before travelljng was also great. They responded to all my questions quickly and even changed my pick up time after I had booked. As expected. Waited at bus stop, shuttle showed up around 10 minutes after pick up time. Transfered at BSI terminal for bigger bus. Reasonably priced. Good. Besides, the staff helped me a lot as I have to change my original plan due to the flight delay. Thank you so much! Great transfer, easy and on time! Great service, professionally ran. No problems with pick ups or drop offs. Made the whole experience easy and carefree. No issues. Reykjavík Exursions picked us up at the bus stop, we drove to the BSI terminal, you stop and grab your return ticket from Blue Lagoon, and it’s around a 30 min drive there! On time, organized well, and even had options on times for the shuttle back, so you could stay as long as you wanted at the must-visit Blue Lagoon! The bus transfer was on time and organised very well. We were frustrated with this service because our original bus stop was cancelled so we had to walk about 1/2 mile to the new bus stop. Then the bus picked us up from the downtown bus stop and did NOT take us to the Blue Lagoon, it took us to the main bus stop and we had to wait another 20 minutes to board a 2nd bus that then finally took us to the Blue Lagoon. There were plenty of other bus services we could have gotten on 1 bus that was headed directly to the Blue Lagoon and we would have spent over an hour LESS traveling to the Blue Lagoon on other bus lines. Next time we will take another line that takes us directly there and doesn't make us transfer buses. Wonderful experience. Very easy to use and my drop off/pick up point was within a 3 minute walk to my hotel at the Hilton Konsult... I'll definitely use again. Great, very easy and perfect that the return was flexible, thanks. We had a perfectly wonderful experience with the bus pick up from our normal bus stop and then off to the Blue Lagoon!! Pick up was on time and we made it about 15 minutes early to our 2:00 reservation which gave us enough time to check our bags and walk to the reception area. What can I say about the Blue Lagoon but WOW!! I thoroughly enjoyed this so very VERY much!! I was not sure what to expect and just fell in love with this place and would fly back for a 3 day weekend and stay at one of their hotels and never leave until my flight home. The pick up after was easy as can be. Grab your bags and load on the load and off to the airport we went. The bus arrived about 15 minutes prior to pick up and left at 6:00 sharp. Could not have been easier and this was the best way for us to spend our last day in Iceland. Thanks so much for the no-stress, hassle-free pick up and drop off to both the Blue Lagoon and then on to the airport! The Blue Lagoon is a Must Do Experience. It is so popular that you must reserve your 90 minutes visit and coordinate with a bus shuttle. The only time slot available to us was 9 PM, the last slot. Therefore we took the last shuttle back at 11:15 pm. The bus was full of people (50+) and the driver had difficulty remembering where to go and when to stop to let people off. We were lucky that we recognized the bus stop close to our hotel. Other people had to walk back in the middle of the night. Everything we could have imagined... never being to Iceland we stayed at an amazing AirBNB (Erla's Place) and got to see the best of Iceland (West) that we could in the two days. Would love to come back and explore the other areas of the country. I would definitely recommend Guide to Iceland and their shuttle service. Their booking application was seamless and efficient including when I made several changes to my pick-up time. All of the busses I utilized during my trip were very prompt in their timeliness and civility. The way it worked for me was I arrived to my pre-determined bus stop pick-up and the bus driver had my name to verify my ticket. The shuttle bus then went to the main BSI bus terminal for entry to the main bus which headed for the Lagoon. When I was ready for departure to the airport, I hopped on the next bus in the lot. Thank you for this service and making the tourist experience so seamless! Shuttle bus from our bus stop was efficient. After a short wait at the BSI terminal we were on our way to Blue Lagoon. Bus ride was quiet and the WiFi is a bonus. We were not offered a chance to arrange our return transportation but rather simply hopped on one of the busses as per the schedule we were given. Would recommend! Easy and sufficient! Collected us exactly on time and was so quick on getting to the Blue Lagoon, an added bonus was the chargers on the coach which helped boost my battery to take some amazing pictures of our experience at the Blue Lagoon. Couldn’t be happier with this company! The Blue Lagoon was a perfect way to finish my visit to Iceland. The water is beautiful and makes your skin feel wonderful. It was so very relaxing. The Blue Lagoon was the perfect start to a fantastic stop-over. Although the water is much bluer in the Winter months, it was still gorgeous and a very relaxing evening. We opted for the comfort package which included the towel, a drink, and an extra mask and it was well work it. The Blue Lagoon is a must-do in Iceland, and this shuttle bus is very helpful. We saw northern lights on our way back to Reykjavik, and the driver let us off the bus to enjoy the lights for a few minutes. That was amazing. Thank you! Overall, I had a great experience at the Blue Lagoon. The shuttle bus was prompt for both pick-up and drop off times and the lagoon itself was absolutely amazing. Although we did not stay at a hotel, the staff were accommodating in selecting the closest one in which we could walk to. Extremely cold , sleet rain , dark . Unable to enjoy the scenery/ background as we were scheduled to go at 1700 . A lt of people during our scheduled time as tourist coming / leaving for airport as well . Wish we could have gone daylight instead! In overall, it was a nice experience for me and my friends. However, I'm quite disappointed for the pick up process, we booked the pick up time as 15:30pm， and I though this is the time when the bus will come, but unfortunately after 15mins till 15:45, the bus didn't show up so we called to the customer service, and get told we have to wait between 15:30-16:00? And the advisor seem not really happy with the question that we asked, so my thought is, it would be great for the service provider, create ac"track" app so we can track the bus and not have to worry about miss the bus and rest of the jounery was great! Very easy and convenient way to get to the blue lagoon and airport!! Transfers were very efficient and the Lagoon was brilliant. Tip- check pick up times for the return journey so you don't need to hang about! Great! The lagoon was incredible! Staff are helpful and polite. Very good experience. Comfortable bus, they picked me up with no delay. However, the drop off was poorly organized; even though the bus passed very closed to my accommodation when entering Reykjavik the driver didn't stop and I had to wait that all the other passengers were dropped off before ending up to the bus station and bounced to another driver who, finally, brought me near by my accommodation. We chose the pick up point bus stop 10, they arrived on time but we have to switch to the bus and the ticket at bus station. When we then departed from Blue Lagoon, because company did not count earlier, the capacity was not enough for people leaving to the airport at that time. But they added another bus for those who did not have seats, so the problem solved, that is fine. The worst was the attitude of the staff in the airport reception afterwards. When we arrived in the airport, our suitcase was taken by other people and they left an anonymous luggage. We reported this issue to the reception, they denied the bus was from their company even I still hold the bus ticket showing their company's name, and they even did not make any efforts for us to solve the problem. I am not blaming to the bus service, actually it was the staff's attitude upsets me the most. Wish I could give this zero stars. They never picked me up from the location that I had confirmed, then they refused to give me a refund. Extremely terrible bus company. We made it on time to catch the bus to airport but the staff told us there is no bus at that time as it was stated on timetable. No explanation. No solution. No aid from any staff. CONTACTED Guide to Iceland BUT THEY SAY IT'S NOT THEIR JOB TO COMPLAIN AND ADJUST THE SERVICE. WE WERE KICKED BACK TO ASK THE SERVICE OPERATOR BUT NO ONE ANSWERED ANY PHONECALL. ASKED this website again where to complain and they say email the service operator. DONT EVER BOOK WITH THEM AGAIN. No bathing suits included for the non-premium package. And people took our showering towels by mistake. Bad. The stuff in office give me a wrong ticket and refuse to take any responsibility for that. Great place... However, I took the last coach to the Blue Lagoon and got there at 6pm - not enough time for such a wonderful pjace!! I would recommend people to get there as early as possible to make the most of it!! View is good, facilities are new, and also provides drink and mask for customers! Overall is excellent! The experience was amazing. Iceland is so different to anywhere else on earth. The tours were fantastic; we saw the northern lights which were beautiful, stood between tectonic plates in the national park, and then ended it all with a relaxing day at The Blue Lagoon. Great trip! Super. Brought three teenagers, and they found it magic in the Lagoona. The guide was fab - full of info about a whole range of things from carbon emissions in Iceland, education, geology, geography, local culture, history etc. Loved listening to him! He was a real expert and very personable. The golden circle tour was very rushed due to limited light. I would have preferred to spend more time at Gulfoss and less at the Geysir. It would have been useful to understand the timings before the tour e.g. you would only have 20mins at the waterfall as I may have booked things differently. The snow mobiling was disappointing due to the terribly foggy weather. We spend so much time waiting for people to catch up, and could only go slowly - but I understand this is out of control of the guide as this is all weather related. One thing that was frustrating was that we spent 15 mins on a break half way through the snow mobiling - just sitting around while some people played around in the snow and the guides threw some snowballs. It was really cold, and felt like valuable time was wasted sitting around rather than snowmobiling. If I were booking again, I would book a golden circle trip one day, adn then a smaller group snowmobiling on a different day. It's hard to enjoy somewhere when you only have 20 mins there. Equally we had a very short time at the national park, and found out afterwards that there was a waterfall at the end of the path - only an 8 minute quick walk from the car park, but we didn't know it was there so didn't race off to find it. Thanks tothe guide though - he was fab! Sights themselves are stunning. On the way out the bus was on time and comfortable. Unfortunately the return journey was not so. The bus parked where we were told it would be, the driver got out and I asked was this the 4.00pm shuttle and he said “ no “ and kept on walking. The crowd got bigger and bigger and we got colder and colder as the driver walked back and forward to the back of the bus with a bottle of water ( obviously filling a radiator). After 30 minutes the bus had to move position and I, and a number of people, asked again if this was the 4.00pm shuttle or was another bus coming. This time the answer was “ yes “ and then it was a real scuffle as everyone boarded, people were saving seats and it took ages to check tickets ( he was doing it really slowly through the front door and I mean REALLY SLOWLY) Then when we got underway the bus broke down and we had to wait for a replacement ride. This was the first time the driver actually spoke to the passengers as a group - to mention that we needed to change buses. Breakdowns happen BUT the driver could have done a number of things better : 1) make an announcement that he needed to refill the radiator and apologise for the delay 2) let people board and then check the tickets ( did I say it was getting really cold ? ), especially open both doors to make boarding quicker - once everyone was seated checking tickets would have been quicker and more efficient. 3) when we broke down the driver got out and left the engine off and both doors shut. Eventually a passenger went up and opened the middle door to get some air circulation We got home nearly 90 minutes later than expected. The Blue Lagoon was nice; however there was some confusion about what was included. I booked several tours through Guide To Iceland so realize that all the tours are from potentially different tour operators! (This was how I missed my ride for the Golden Circle tour.) 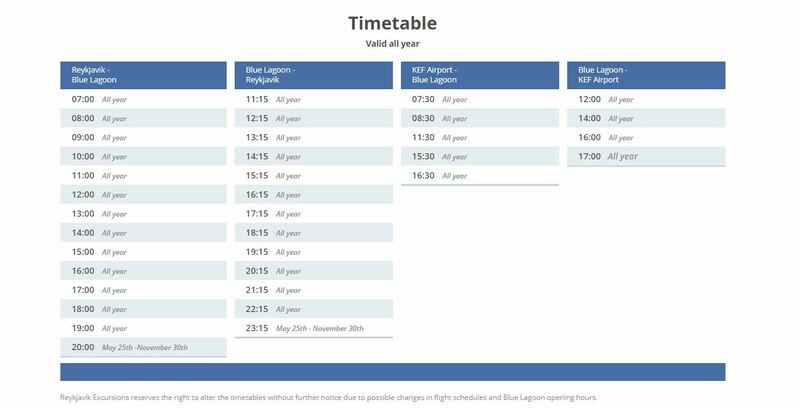 Also, you must book directly with the Blue Lagoon for an entry ticket, in advance. This cannot be overstated enough! I was under the impression that I was paying for the transportation and entry fee (which the website says is not included). Realize that you cannot arrive at the Blue Lagoon and buy tickets on site; when this happened to me I was told the next available slot was at 10:00 PM that night. Uh, no thanks. However, shuttles run back and forth all day long, every hour, so I would worry less about booking a ride in advance and focus only on deciding what day and time you want to visit and book with Blue Lagoon directly ahead of time. I will say though, that my tour experiences in Iceland were generally well-organized and even when the consumer (me) was at fault, the vendors were very kind and reasonable did their best to accommodate the customer. This is one of the best things about visiting this stunning country!